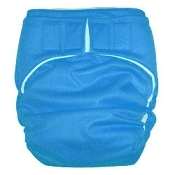 The Imagine One Size Stay Dry All-in-One Cloth Diaper is the perfect cloth diaper! The snuggly soft polar fleece inner is fabulous at wicking away moisture, keeping your baby comfy and dry. The outer is a waterproof polyurethane laminate (PUL), which keeps the wetness contained. 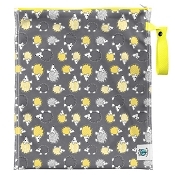 Inside, a fleece-topped four layer microfiber soaker snaps in, allowing you to get absorbency customized for your baby's needs AND a quck drying time! 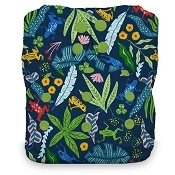 The Imagine One Size Stay Dry All-in-One Cloth Diaper (or AIO) has superb elastic designed to both contain your baby's output and keep your baby comfortable... and it has a fabulous price point to keep your wallet comfortable, too! The Imagine One Size Stay Dry All-in-One works like a disposable diaper, except you wash and reuse. All you need to do is put the diaper on your baby, and when it's wet or soiled, remove the entire diaper and place in your diaper pail. No stuffing, no pinning, no folding! This AIO diaper is adjustable to fit most babies from 8-35 pounds. To prep: Wash and dry one time, then begin use.